A pro-Palestinian pressure group claimed success last week after Edinburgh Council rejected an attempt by a controversial firm to take over a range of public services in the city. The Scottish Palestine Solidarity Campaign (SPSC) had argued that Veolia should be excluded from Council contracts because of the company’s involvement in Israel’s Occupation of Palestine. Veolia had been shortlisted to take over environmental services contracts, including refuse collection and street cleaning, but a Council report published Friday indicated that the firm is no longer being considered. This latest blow for Veolia comes on top of similar multi-billion pound losses around the world, and is likely to add to the pressure on the firm to cease providing waste and transport services to Israel’s illegal settlements in Palestine, including the construction of a tramway that the United Nations Human Rights Council deems, “in clear violation of international law”. The line is set to link Israel with some of its illegal settlements. The Labour group had also argued for a boycott of the company during the Council’s August meeting. A motion proposed by Councilor Angela Blacklock stated, “Veolia provides services to illegal settlements in Occupied Palestinian land and is therefore complicit in grave breaches of international and human rights law committed by the state of Israel”. A fire has ripped through a garment factory in the Bangladeshi capital Dhaka, killing at least 20 workers and wounding over 100 others. 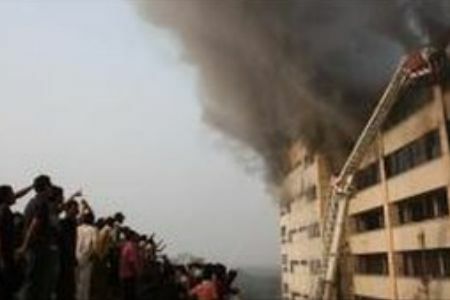 Around 5,000 people were at the factory when the fire broke out on the ninth floor. About 50 people have been taken to hospital with severe burns. Many more are stranded on the roof of the 10-story building. Police sources say others were injured in a stampede of hundreds of workers trying to escape to safety. “It is a big fire and many workers are trapped on the roof of the building. We are mobilizing all our teams from around the city,” AFP quoted fire department Chief Abu Nayeem as saying. Fire teams have been mobilized from across the capital to control the blaze. Fires are common in Bangladesh clothes factories. Scores of workers are killed each year due to fires sparked by substandard electrical wiring in these factories. This comes as thousands of garment workers in Bangladesh have launched a strike over low wages and poor working conditions over the past months. At least four workers died on December 12 after Bangladeshi police opened fire with live ammunition on protestors, who had demanded the implementation of a hike in the minimum wage, approved by the government and industry in July. The violence in the Asian nation erupted after the government refused to increase the minimum wage from $27 to $73 a month. Union officials have argued that the pay rise is not sufficient to ensure a minimum standard of living for workers in the face of surging prices. In a rough style, by way of unique footage, the brutal consequences of modern wars are exposed. The film also depicts the ability of women and children to handle their everyday life after a dramatic war experience. Many of them live in tents or in ruins without walls or roofs. They are all in need of money, food, water and electricity. Others have lost family members, or are left with seriously injured children. Can war solve conflicts or create peace? The film follows three children through the war and the period after the ceasefire. Disturbing, powerful and emotionally devastating, Tears of Gaza is less a conventional documentary than a record – presented with minimal gloss – of the 2008 to 2009 bombing of Gaza by the Israeli military. Photographed by several Palestinian cameramen both during and after the offensive, this powerful film by director Vibeke Løkkeberg focuses on the impact of the attacks on the civilian population. The film shuttles between the actual bombings and the aftermath on the streets and in the hospitals. The footage of the bombs landing is indelible and horrifying, but it is on par with much of the explicit imagery on hand. White phosphorous bombs rain over families and children, leaving bodies too charred to be identified. The footage here is extremely graphic and includes children’s bodies being pulled from ruins. Recounting the horrors she has witnessed, one young girl collapses and sinks out of the frame. Years of economic embargo have left the area deprived of resources and have strained an already impoverished infrastructure. The wounded are carried to hospital for lack of ambulances, and an absence of fire trucks leaves home owners to put out fires on their own. What’s immediately apparent is that decades of military activity have made the population angry, nihilistic and vengeful. As one young boy says, “Even if they give us the world, we will not forget.” Løkkeberg contrasts these scenes with footage of bachelor parties, weddings and visits to the beach – social activities that epitomize daily life in Gaza during more peaceful times. Tears of Gaza makes no overriding speeches or analyses. The situation leading up to the incursion is never mentioned. While this strategy may antagonize some, it’s a useful method for highlighting the effects of the violence on the civilian population. Similar events certainly occurred in Dresden, Tokyo, Baghdad and Sarajevo, but of course Gaza isn’t those places. Tears of Gaza demands that we examine the costs of war on a civilian populace. The result is horrifying, gut-wrenching and unforgettable. Witnessing the maiming and killing of children in a war, without being able to do anything about it, is a great challenge. The short glimpses of children’s faces displayed on my TV set, after they had lived through the war, was my motivation for making Tears of Gaza. A protest against all wars grew inside me. Wars are senseless, destructive, unworthy of mankind. Wars are never a solution to bilateral problems in the long run. In my films, I have always been concerned with the fate of the victims. In the Gaza-Israel conflict, there are presumably two victimized parties. A responsibility which both the USA and Europe will have to shoulder. My hope is that this film will arouse the same feelings of protest among the audiences, and that it will bring inspiration to continue the seemingly endless struggle against poverty, suffering and war. This film has been a year in the making, and it’s a pleasure to let its world premiere take place in Toronto. I started my career as a documentary filmmaker. From the 1970’s on, I made feature films. In this film, I have chosen to make use of the implements of fiction, and the cinema theatre as venue. In contrast to TV, the cinema theatre provides the opportunity of absorption. My hope is that this emotional approach will spur protest, and the desire to contribute to making a better world. Vibeke Løkkeberg (b. 1945) has become one of Norway’s most well-known personalities and leading feminist artists; as actor, director, screenwriter and author. She has directed five features and written five novels. She has starred in her own films as well as films by Pål Løkkeberg. Progressive organizations have praised the Wikileaks endeavor. Our own website, Global Research, has provided extensive coverage of the Wikileaks project. At the outset in early 2007, Wikileaks acknowledged that the project had been “founded by Chinese dissidents, mathematicians and startup company technologists, from the US, Taiwan, Europe, Australia and South Africa…. [Its advisory board] includes representatives from expat Russian and Tibetan refugee communities, reporters, a former US intelligence analyst and cryptographers.” (Wikileaks Leak email exchanges, January 2007). Wikileaks formulated its mandate on its website as follows: “[Wikileaks will be] an un-censorable version of Wikipedia for untraceable mass document leaking and analysis. Our primary interests are oppressive regimes in Asia, the former Soviet bloc, Sub-Saharan Africa and the Middle East, but we also expect to be of assistance to those in the west who wish to reveal unethical behavior in their own governments and corporations,” CBC News – Website wants to take whistle-blowing online, January 11, 2007, emphasis added). Media disinformation has become institutionalized. The lies and fabrications have become increasingly blatant when compared to the 1970s. The US media has become the mouthpiece of US foreign policy. Disinformation is routinely “planted” by CIA operatives in the newsroom of major dailies, magazines and TV channels: “A relatively few well-connected correspondents provide the scoops, that get the coverage in the relatively few mainstream news sources, where the parameters of debate are set and the “official reality” is consecrated for the bottom feeders in the news chain.”(Chaim Kupferberg, The Propaganda Preparation of 9/11, Global Research, September 19, 2002). Since 2001, the US media has assumed a new role in sustaining the “Global War on Terrorism” (GWOT) and camouflaging US sponsored war crimes. In the wake of 9/11, Defense Secretary Donald Rumsfeld created the Office of Strategic Influence (OSI), or “Office of Disinformation” as it was labeled by its critics: “The Department of Defense said they needed to do this, and they were going to actually plant stories that were false in foreign countries — as an effort to influence public opinion across the world. '” (Interview with Steve Adubato, Fox News, 26 December 2002, see also Michel Chossudovsky, War Propaganda, Global Research, January 3, 2003). The Economist has a close relationship to Britain’s financial elites. It is an establishment news outlet, which has, on balance, supported Britain’s involvement in the Iraq war. It bears the stamp of the Rothschild family. Sir Evelyn Robert Adrian de Rothschild was chairman of The Economist from 1972 to 1989. His wife Lynn Forester de Rothschild currently sits on The Economist’s board. The Rothschild family also has a sizeable shareholder interest in The Economist. It is also worth mentioning another important link. Julian Assange’s lawyer Mark Stephens of Finers Stephens Innocent (FSI), a major London elite law firm, happens to be the legal adviser to the Rothschild Waddesdon Trust. While this in itself does prove anything, it should nonetheless be examined in the broader context of Wikileaks’ social and corporate entourage: the NYT, the CFR, The Economist, Time Magazine, Forbes, Finers Stephens Innocent (FSI), etc.